Magnolia Manor Assisted Living Facility is the epitome of “Southern Hospitality and Old Fashioned Care”. The wrap around porch and giant stone fireplace welcome you home as you enter the spacious living room and dining hall. A southern pitcher of flavored water encourages residents to stay hydrated during the hot summer months. The family owned and operated assisted living facility offers private and semi-private studio suites, complete with bathrooms, cable television sets with 90 channels and individual heat and air controls. Safety rails in each bathroom and emergency call systems add to the feeling of security. Magnolia Manor has daily and weekly activities as well as monthly parties. The full-time activities director plans a variety of events, including movie time, bible study, Jewelry or Cookie Bingo, and Happy Hour on Fridays at 3:00. Families are invited to join the residents for music, appetizers, and cocktails. To keep the residents healthy and active, they can participate in the weekly walking club, Lift a Weight, or Sit & Be Fit. For the kid at heart, there’s Balloon Battle and the Parachute Game. A massage therapist visits the facility on a monthly basis. Residents are treated (at no charge) to a soothing massage. Residents enjoy sitting on the screened lanai looking out onto the beautifully landscaped grounds. A piano in the main community room provides residents with the opportunity to play or sing along. A computer room with internet and wifi, an on-site beauty parlor, and in-house medical care are available for convenience. The facility schedules weekly shopping trips and visits to the library to give the residents the opportunity to spend time in the community, and can provide transportation for appointments and other trips, as needed. Animal therapy is known to reduce stress and bring joy to people. The pet-friendly facility has three in-house dogs. Barbara Keithly, the owner, brings her two dogs, Paxton and Pixie, and her son brings his dog named Nala. “Pixie is the greeter. She will even go to visit the residents in their rooms and they love her!” said Barbara. In addition to spending time with the Keithly’s dogs, residents enjoy visits from organizations like Canines for Christ and Paws for Friendship. The therapy dogs and their owners volunteer their time to visit with the residents and share God’s word along with the never ending love and affection dogs can give. 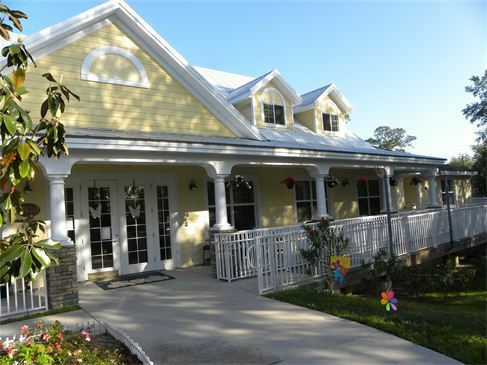 Magnolia Manor Assisted Living Facility is located at 17420 Old Tobacco Road, Lutz , FL , 33558. For more information, visit http://www.magnoliamanoralf.com/ or call 813-918-0588. Thank you so much for your kindness and consideration. It is much appreciated. God bless. Our family wants to thank you for the wonderful care our mother received during her stay at Magnolia Manor.She was always treated with respect and love, for which we will always be grateful. Next PostNext Craig J. Olsen, P.A.